Above all, it is our knowledge, experience and expertise in the fence industry that allows us to deliver such high quality fence services to the Lakewood area. We are a local family owned and operated business that is passionate about fencing. Our first love was working with iron to make beautiful, long lasting fences, handrails and window bars, but eventually expanded into all types of materials, including wood, vinyl, steel, cinder block and aluminum. We have installed 1,000s of fences in our 30 years of business, and everyone on our team is a master craftsman, averaging about 15 years of experience each. We believe in building honest relationships with our clients, starting with a free consultation and price estimate. We listen carefully to learn about your requirements, style and budget. Then, after taking a land assessment and measurements, we will provide a comprehensive upfront price quote. Our team can help you determine which materials will best suit your needs, and offer suggestions if the price isn't quite where you need it to be. Once you commit to working with us, we will work hard to realize your vision by using premium materials and expert construction techniques, as well as close oversight by ownership. We are licensed, bonded and insured, and known for our honesty, professionalism and reliability. Call today to make your appointment! Browse our extensive online fence gallery to get an idea of what we can do for you. We masterfully build iron (both wrought and ornamental iron), chain link, vinyl, wood and aluminum fences for both commercial and residential use in Lakewood at competitive prices. However, our gallery is only a small sampling of the thousands of fences we have built over the years. In every case, we custom made each fence to suit the preferences and budget of each customer. In addition to standard privacy, semi-private and open fences, we also erect chain link fencing (often with windscreens, privacy slats, barbed wire or razor wire), wood stockade fencing with iron tips, cinderblock walls with iron pickets, and security iron fencing. We believe in offering customized services, so no matter what your fencing needs are, we can meet them. Call us today. Built to match or complement the adjoining fence, a gate is the final touch to complete any fence project. We can install swinging gates, rolling/cantilever gates, double entry swinging gates, and gates with latches, operators and/or access control systems. 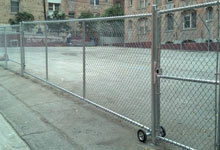 We also offer our Lakewood commercial clients aluminum roll up doors and steel single and bi-parting folding gates. Call today to speak with one of our fence and gate specialists. 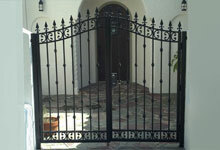 Our gates are made with the same high quality materials, construction and hardware as our fences. 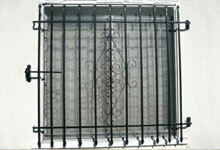 The largest part of our business in Lakewood comes from clients who are interested in our ironwork. We are one of the few fence contractors that hand-forges security iron, ornamental iron and authentic wrought iron. This iron makes gorgeous railings for walkways, balconies and staircases, particularly when galvanized and powder coated. These handrails can have a variety of caps or be combined with wood to create a unique but elegant look. We can also paint them any color of your choice. Call J&J Fence today to discuss what you would like us to create. In addition to handrails, we can also forge and cut iron to make simple to intricate bars, grills and grates for windows of all sizes and shapes. 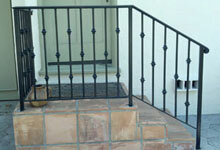 Like with railings, we can make window bars in ornamental, security or wrought iron. Call us today to discuss your ideas. On-site consultations and price quotes are free.